Rush University Medical Center is planning to move administrative offices into a vacant Little Italy bank building, an alderman confirmed this week. 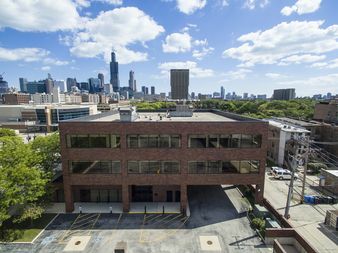 LITTLE ITALY — Rush University Medical Center is planning to move administrative offices into a vacant bank building in Little Italy, an alderman confirmed this week. Ald. Jason Ervin (28th) will host a community meeting on the proposed office use for 1201 W. Harrison St. at 7 p.m. Wednesday in the school hall of The Shrine of Our Lady Of Pompeii, 1220 W. Lexington St. The developer who owns the building is seeking a zoning change that would allow the continued office use, according to Tom Bowen, an Ervin spokesman. The National Republic Bank of Chicago was formerly located at the site before regulators closed the small lender in 2014. "It has expired and it's necessary to update the zoning in accordance with the usage of the property and how it will impact the community," Bowen wrote in an email. The site is located near the UIC Pavilion and a few blocks east of the Rush University Medical Center campus. A notice of the meeting was sent to neighbors this week. Neighbors with questions ahead of the meeting should reach out the Ervin's office at 773-533-0900. In March, Rush University Medical Center demolished blocks of buildings along Harrison Street to make way for a new outpatient care center.